Pete Wilson’s evocative World War One exhibition layout. First shown in May 2006 at Froissy Fête de la Vapeur near the original WW1 front lines in France. And Society members out in force to run the layout and take part at the Froissy show. Richard Glover’s superb execution of a harbour on the South English coast. Very popular with exhibitions and a joy to operate. 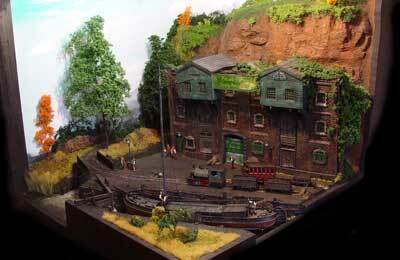 Robin Winter’s beautifully modelled rendition of the Isle Of Man Railway. Very popular on the exhibition circuit. 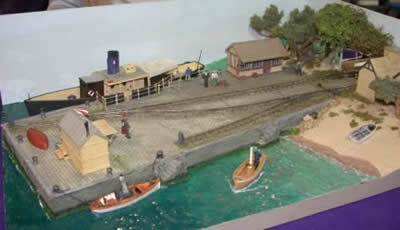 Chris O’Donoghue’s Nottery Quay is a very well known and popular layout with quay and a beach station reminiscent of the Rye and Camber railway. 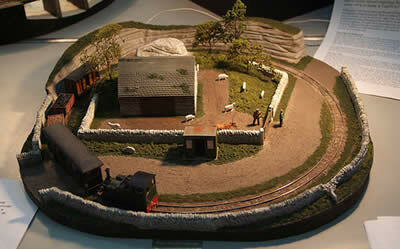 David Calderwood’s new layout with a rack railway and the Diamond Mine originally built for the Cubic Challenge. This layout is near completion and is expected to join the exhibition circuit starting with ExpoMetrique in December 2006. For more pictures please visit the Craignure and Torosay Line website. Originally built by Robin Winter as a tiny exercise on 3ft Irish prototypes, this now belongs to Neil Sayer. Winner of the 2005 ExpoNG Cubic Challenge competition. Simon Cox joined the Society soon after winning the event and Loxley Barton can occasionally be seen at exhibitions. More details can be found at the Loxley Barton website. Chris ODonoghue’s entry to the 2005 ExpoNG Cubic Challenge competition. 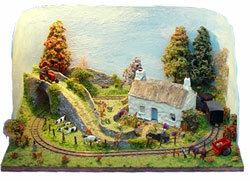 Annie Winters delightful micro layout in 009 centered around a cottage. Has won Annie Best Junior Modeller at Amberley for 2 consecutive years. Members were invited to enter a Society only competition to build a Pizza type layout which were exhibited at ExpoNG 2007. Pizza layouts are basically a small round track based around a scene. 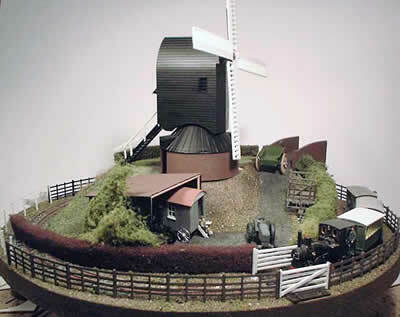 These are great to show an individual scenic modeling skills and although operationally they lack everything it does give time to have a good natter with the public at a show! 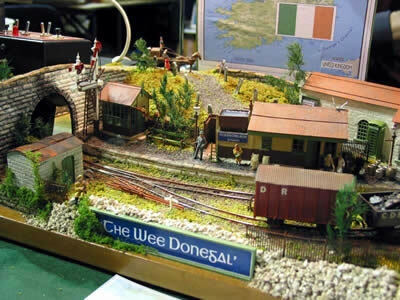 The competition was judged remotely by Carl Arendt, publisher of the Micro and small layouts for model railroads website. Chris O’Donoghue’s pizza based around a windmill. 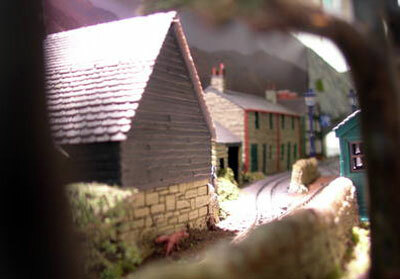 Richard Glover’s Pizza based on a dales scene. Members always have projects on the go. 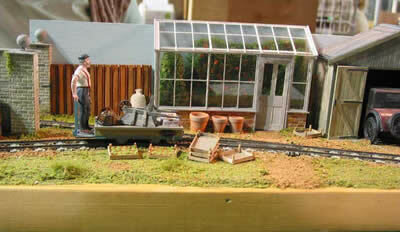 Richard Glover’s layout has actually been exhibited as a work in progress already. 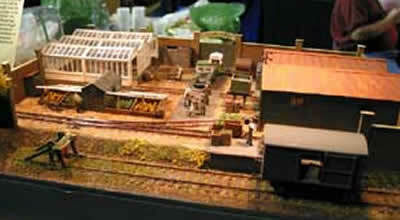 David Gander latest layouts is well under way and was shown at ExpoNG 2007 as work in progress. 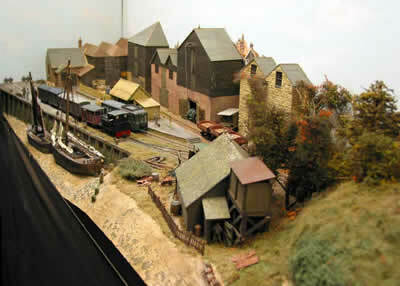 We enjoy taking our layouts to exhibitions and consequently they are booked sometimes years in advance. Narrow gauge railways always add a little something different to normal railway exhibitions and the public always appreciate them. There are many more layouts owned by members that are not listed here for many reasons, if you invite the Society to exhibit at an exhibition we will always ensure that we are able to display at least one of the members layout. We have not published a list of when and where each layout will be exhibited as the layouts are owned by individuals and not the Society so we do not have up to date info about each layout or its availability. 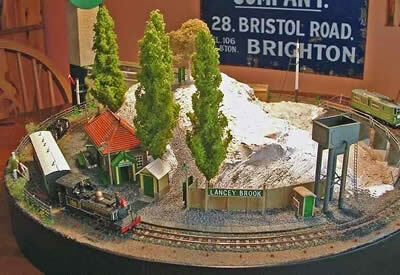 If you wish to invite one of our layouts to your exhibition then please send details using our contact page and the owner of the layout will get in contact with you.